The winter sun can be just as strong as the summer sun which is why it’s important for kids to keep their eyes equally as protected on a snowy mountain as they would at the beach. While sunglasses won’t be of much help during a ski session, a quality pair of ski goggles will absolutely do the trick. At Quiksilver we are experts when it comes to knowing what kids need to keep them comfortable and protected as they work on progressing their ski skills. Our collection of kids ski goggles is another example of how we are constantly innovating to design products for kids that allow them to enjoy every minute of their time outdoors and we take pride in being able to provide kids ski goggles they can learn to trust at a young age. Goggles are an accessory that every young skier should get into the habit of wearing and also an accessory that they should take the time to learn about so they understand the difference between lenses and how they are functional for different types of light and weather. Quiksilver designs the best ski goggles because we utilize the best technologies. Our kids ski goggles are made with premium materials and lenses that are capable of performing in a variety of weather conditions. We make polarized ski goggles for days when the sun is extra bright and photochromic lenses that can transition as the light does in order to automatically correct the ability to see properly. We believe that ski goggles should be an enhancement to kids vision rather than a distraction from it which is why we offer different lense styles and options in order to create the most flawless visual experience for kids while they ski. Being able to see clearly on the mountain is something that we take very seriously, our kids ski goggles are designed to provide clear vision even through the heaviest of snowfall so that kids never feel like they can’t see what is ahead of them. 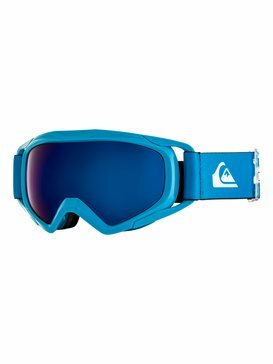 Along with a wide range of lens capabilities Quiksilver also understands that there are some visual impairments standard ski goggle lenses cannot correct. For this purpose we have created a selection of prescription ski goggles so that kids with glasses don’t have to worry about sacrificing their vision quality in order to wear their ski goggles. Kids ski goggles that offer prescription lenses are one way that we are making the effort to ensure that every kid can benefit from our collection of ski goggles each season so that they can better enjoy the time spent perfecting their skills on their skis. Quiksilver has all of the ski goggles kids need this winter season. Shop our full collection of kids ski goggles in our online store and buy the pair that fits best. There are many different types and styles of ski goggles so if you run into any questions when debating between your choices, simply ask our free customer service help line and they will provide the answers you need to make the best purchase decision.